Twenty commercial mixed herbal drugs were examined for mycological profile. Aspergillus species were the predominant fungi found in the drugs. 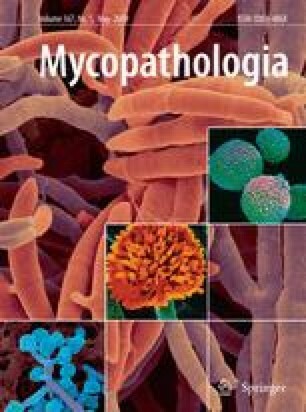 Other fungi harboured in the drugs with less frequency were Paecilomyces species, Eurotium species, Monascus species, Acremonium species, Penicillium species, Cladosporium species, Scopulariopsis species, Phialophora species and Fonseceae species. Fungal count was between 1.0 log10 CFU and 2.4 log10 CFU per gram of sample. When the drugs were incubated in 85% humidity at 25°C, fungal colonies grew on only two of the drugs. The mixed herbal drugs were extracted with water and the extracts were used to grow Aspergillus parasiticus. All extracts reduced aflatoxin B1 and aflatoxin G1 production by 62–97%. All but two of the extracts reduced aflatoxin B2 and aflatoxin G2 production by 39–95%. It can be concluded that the commercial powdered mixed herbal drugs contained low number of endogenous fungi, and these drugs are inhibitory to the growth of its endogenous fungi and aflatoxins production by aflatoxigenic fungi. The authors wish to thank Dr. Rasadah Mat Ali, Deputy Director of Medicinal Plants Department, Forest Research Institute of Malaysia (FRIM), for providing the medicinal plants used in this research and also to Zainon Abu Samah for authenticating the plants. This research work was sponsored by the Public Service Department of Malaysia through the Federal Government Training Scholarship Program.